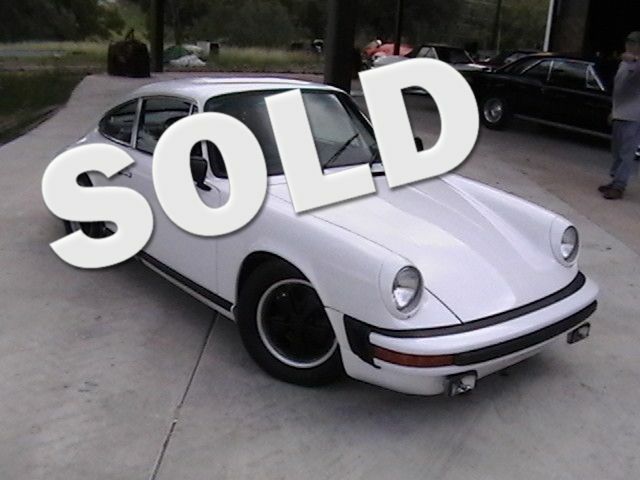 This is a very nice 1974 Porsche 911 automobile. As you can see from the pictures, it has a wonderful interior with no rips or tears in the seats. It was just recently repainted the original white color and looks great. Despite a now decade-old basic design, the 911 seemed to have aged hardly at all. Of course, it was still getting better -- and not a moment too soon, given the upheavals that rocked the American auto industry for model-year 1974. The toughest U.S. emissions standards ever made most engines less efficient than ever. A new federal edict for 5-mph bumpers brought power-sapping weight and ugly looks to too many cars. Inflation was still pushing prices up and sales down, even as soaring insurance rates continued devastating the ranks of performance machines. But the real shocker came in late 1973 from a heretofore little-known cartel called OPEC -- Organization of Petroleum Exporting Countries -- which decided to make "black gold" as precious as real gold by shutting off Middle East pipelines. Long waiting lines began to form at gas pumps across the United States, and prices for all petroleum-based products went out of sight. That winter was longer and colder than usual for the world's industrial nations as rationing and other energy-conserving measures threatened to become a way of life. Against this bleak backdrop stood refurbished Porsche 911s that remained uncompromising high performers in utter defiance of the day's news. They naturally had "crash" bumpers, but so skillfully integrated as to look like they'd been there all along. And while many automakers resorted to smaller engines, the 911s got a larger one that met all the latest "smog regs" while sacrificing little in performance or fuel efficiency. Of course, these changes were pure coincidence, for no one could have predicted the events of 1973-74. Still, the Porsche 911 entered its eleventh year as unassailable proof that when the going got tough, Porsche knew how to get going.